F Tomáš Karpov (Moose Jaw, Calgary, 2007-09) has signed a one-year extension with the Basingstoke Bison (England, Premier). This season he had 20 goals and 28 assists in 20 games, while serving as an alternate captain. Karpov also is attending the University of Winchester and working on his master's degree while playing with the Bison. The Kootenay Ice has acquired G Mario Petit, who turns 20 on July 25, from the Everett Silvertips in exchange for a conditional sixth-round selection in the 2018 WHL bantam draft. The pick is conditional on Petit making the Ice’s roster. Petit has backed up Everett starter Carter Hart for the past two seasons. From Île-des-Chênes, Man., Petit is 14-8-8, 2.89, .892 in 37 regular-season appearances. In the playoffs, he is 3-0, 1.30, .953. This is the first trade made by Matt Cockell, the Ice’s new general manager. The Ice is looking for a starting goaltender after Payton Lee completed his eligibility this season. Jakob Walter, 18, also is on the roster after getting into 30 game this season (4-17-2, 5.02, .868). 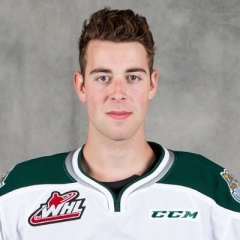 The Silvertips still have eight 20-year-olds on their roster — F Keith Anderson, F Cal Babych, F Patrick Bajkov, D Kevin Davis, D Mackenzie Dwyer, F Matt Fonteyne, D Noah Juulsen and F Devon Skoleski. Juulsen, a first-round pick by Montreal in the NHL’s 2015 draft, has signed and is expected to play in the Canadiens’ organization next season. Hart, 19, remains No. 1 on their goaltending depth chart, with Dorrin Luding, 18, and Dustin Wolf, 16, also there. Ludding, from Prince George, played this season with the Valley West Hawks of the B.C. Major Midget League. He was a third-round pick by the Saskatoon Blades in the 2014 bantam draft. On Dec. 5, Everett acquired him from Saskatoon for a sixth-round pick in the 2019 bantam draft. Wolf, from Tustin, Calif., was a fifth-round selection in the 2016 bantam draft. Wolf has been in the Los Angeles Jr. Kings program for three seasons. Some observers see Wolf as the heir apparent to Hart, the WHL’s goaltender of the year each of the past two seasons. The Edmonton Oil Kings have signed F Jake Neighbours to a WHL contract. From Airdrie, Alta., Neighbours was the fourth overall selection in the WHL’s 2017 bantam draft. He played this season with the Pursuit of Excellence’s bantam prep team, putting up 68 points, including 27 goals, in 30 games. That left him third in the Canadian Sports School Bantam Hockey League scoring race. He had five goals and six assists in five playoff games. The Brandt Centre, home of the Regina Pats, will be keeping its name for at least the next 10 years. Evraz Place announced Thursday that it has cut a 10-year deal with the Brandt Group of Companies for naming rights to the arena. . . . Regina Exhibition Association Ltd., which operates the facility, had been advertising that the naming rights were available. . . . Shaun and Gavin Semple, who are partners in Queen City Sports and Entertainment Group, which owns the Pats, are with the Brandt Group of Companies. . . . The 2018 Memorial Cup will be played in the Brandt Centre with the Pats in as the host team. Cory Stillman is the new head coach of the OHL’s Sudbury Wolves. Stillman, from Peterborough, Ont., played three seasons in the OHL, with the Windsor Spitfires and Peterborough Petes, before going on to a pro career that included two Stanley Cup championships with the Tampa Bay Lightning and Carolina Hurricanes. For the past five seasons, he has been working in player development with the Hurricanes. . . . Stillman takes over from Dave Matsos, who had one year left on his contract when he and the Wolves parted company, saying they weren’t able to reach agreement on a contract extension. James Richmond, who added the general manager’s duties to his head-coaching responsibilities with the OHL’s Mississauga Steelheads earlier this week, has his hockey operations team in order. . . . From a news release: “Assistant coach Jeff Kyrzakos and Mike Doyle, the co-ordinator of analytics, have been promoted from within and will both take on assistant general manager duties. Kyrzakos will also remain as an assistant coach. Former video coach Brendan Taylor will step in to an assistant coach position and join Richmond and Kyrzakos behind the bench next season. Ryan Daniels will remain on staff as the team’s goaltending coach.” . . . As well, Rob Toffoli has been named head scout, after having scouted the Toronto area for the Ottawa 67’s. He is the father of Los Angeles Kings F Rob Toffoli.